Saturday Night Jive - Episode Eleven: "Flappy McDingleberry"
Check out the latest episode of my podcast about Saturday Night Live, just in time to recap an episode from last week (don't worry, the recap for this week's Lena Dunham episode will be posted tomorrow). 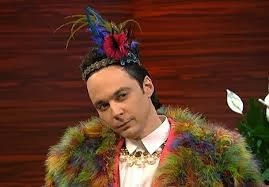 In any case, this week we talk about Jim Parson's SNL debut, hash it out over Big Bang Theory and hipster hate, go out of our way to offend pretty much everybody, and then throw out some character based trivia. Enjoy.